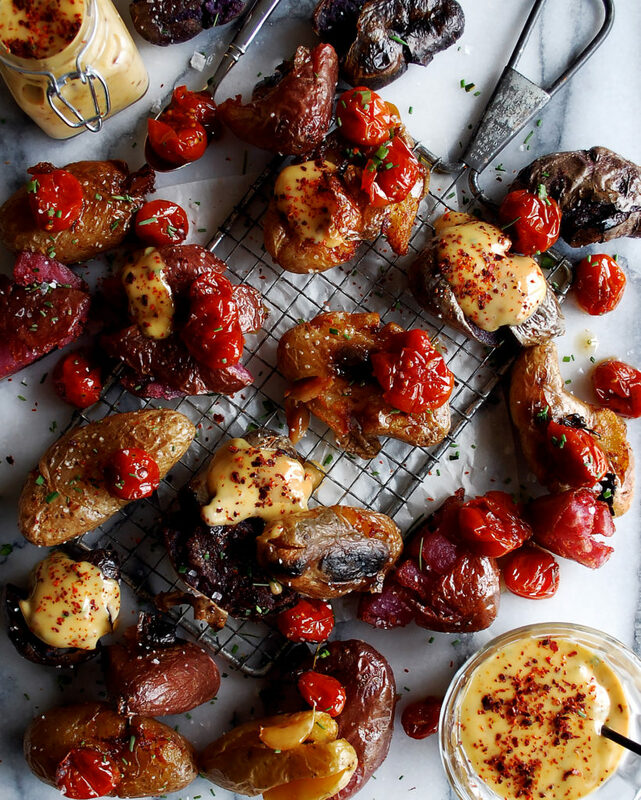 Meet your new favorite side dish (or snack) – smoked smashed potatoes with a creamy tomato confit aioli. Just writing about this dish is making me crave it all over again! The recipe idea came from me wanting really crispy potatoes. And, the best thing for starchy potatoes is of course something creamy (or “fatty”), hence the aioli. 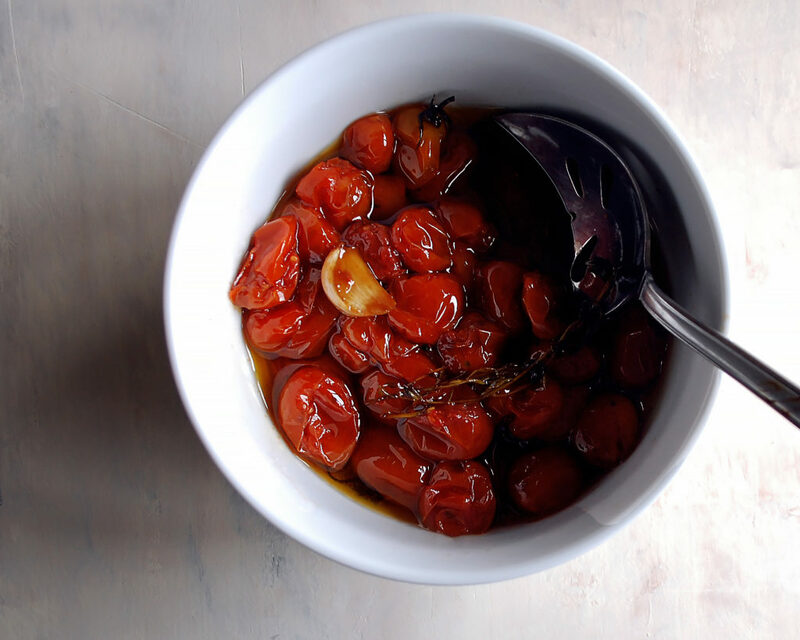 I also really wanted to confit some tomatoes because I had found beautiful late summer cherry tomatoes at the market. 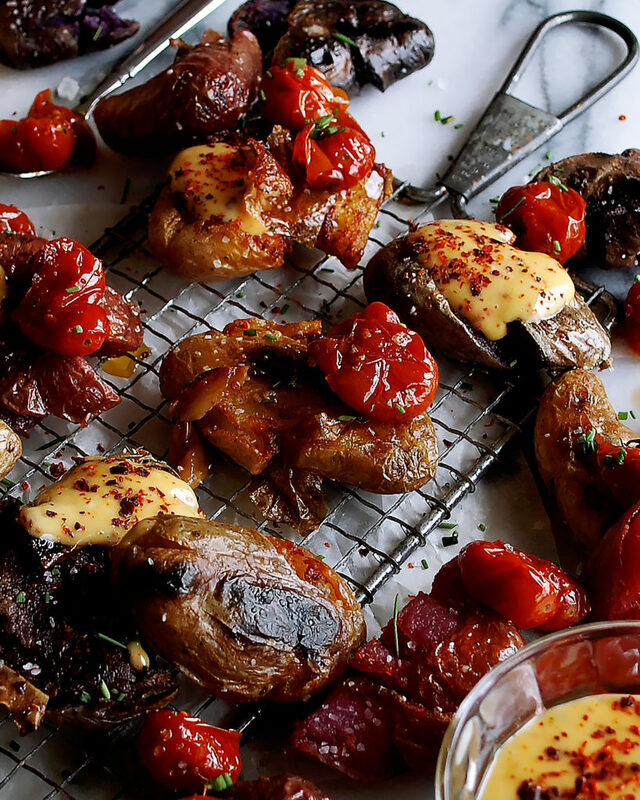 Since tomato season is just coming to an end, turning them into tomato confit is the perfect way to preserve them. And it’s as simple as simmering the tomatoes with lots of olive oil, some garlic cloves (that turn into really soft, sweet little nuggets), and fresh thyme. While the tomatoes do their thing on the stove, I’ll start the smoker and get the potatoes going. We are hot smoking these potatoes until they are just tender and infused with flavor. You can use any wood chips you’d like, but I love the flavor I got from using apple wood chips. Once the potatoes are smoked, I let them cool a bit and smash them until they almost break, but just hold together. I especially love this because to me, there is nothing worse than biting into a huge piece of starchy potato. I tend to like potatoes when they are thinner and you can taste more of what you put onto them rather than the potato themselves. And when they hit the hot oil, the potatoes crisp up so beautifully. Don’t be impatient when frying them. Let the potatoes take their time and develop a really nice golden crust. And the most important part to this entire recipe? Both the potatoes and aioli need to be seasoned…and seasoned well. The potatoes have to be sprinkled with salt as soon as they come out of the oil so that they are still sizzling hot and can absorb the seasoning. And the aioli…it’s important to taste as you add salt so you can adjust the flavor to your liking. The other thing I forgot to mention about the aioli is that if you’ve never made it, you should know it can easily break, meaning the emulsification won’t hold. This typically happens for two reasons: (1) you don’t whisk the egg yolks long enough in the first step or (2) you add the oil too quickly in the second step. Take your time with the aioli and let it come together very slowly. And that is it! I hope these potatoes make your week a little better, because I am sure looking forward to making them on repeat! 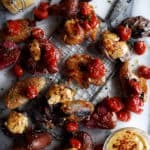 I think they would actually be perfect to eat alongside these romesco grilled chicken BLT sandwiches. Enjoy! In a medium saucepan, add the cherry tomatoes, garlic cloves, thyme sprigs, and extra virgin olive oil. Bring the mixture to a simmer over medium heat. Reduce the heat to low and gently simmer for 1 hour. Let cool. Discard the thyme sprigs. Strain the cherry tomatoes and garlic. Reserve the oil for the aioli. Meanwhile, prepare the smoker over medium heat (I used apple wood chips). Tear two large pieces of foil and place them on top of one another. Place the fingerling potatoes in the center and fold the edges of the foil to create a “dish” for the potatoes. Place the potatoes in the smoker and smoke them for 45 minutes, or until infused with flavor and tender. Let the potatoes cool slightly. Use your hands or the back of a knife to smash the potatoes so they are flat and almost “broken”. Heat a pot of oil to 350°F (or use a deep fryer set to the same temperature). When the oil is sizzling hot, work in batches to fry the smashed potatoes. Fry until crispy and golden brown, about 3-5 minutes. Drain the potatoes on a baking sheet lined with paper towels. Immediately season the potatoes with salt (pretty generously). Keep warm (I like to pop the sheet pan into a 200°F oven or use a warmer) while frying the rest of the potatoes. Meanwhile, in a large mixing bowl, add the egg yolk. Whisk vigorously until the yolk is pale yellow and thick, about 1 full minute. Begin to slowly stream in the tomato confit oil, very slowly, while continuously whisking. Once the mixture looks glossy and like it might just be separating, add a splash of ice water. Continue to add the oil, occasionally adding in more ice water, until all of the oil has been added and the aioli is emulsified. If you rush this process, the mixture will break and never emulsify. Whisk in the Aleppo chili pepper, lemon juice, and chives. Season with salt to taste. 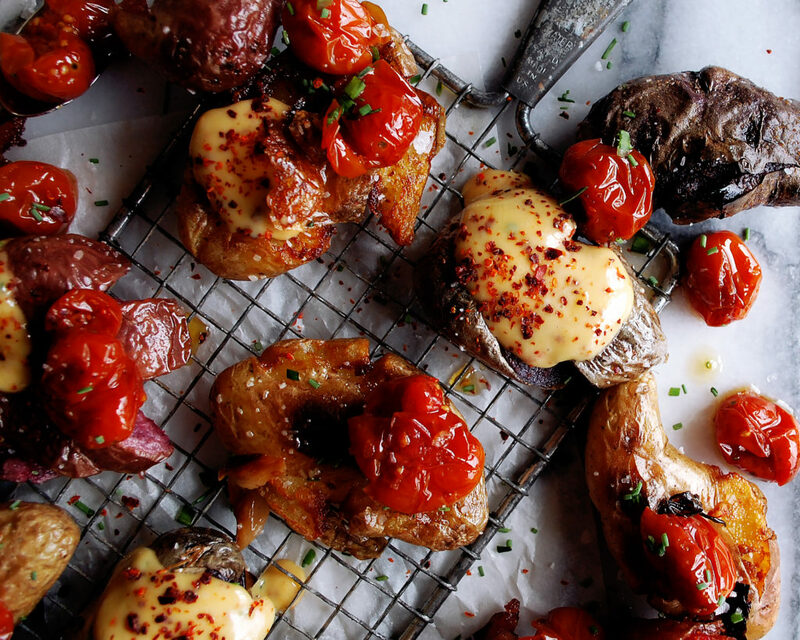 Serve the smoked smashed potatoes with the reserved tomatoes & garlic on top and the tomato confit aioli alongside. Squeeze a touch of lemon juice over the potatoes and garnish with a few extra chives.